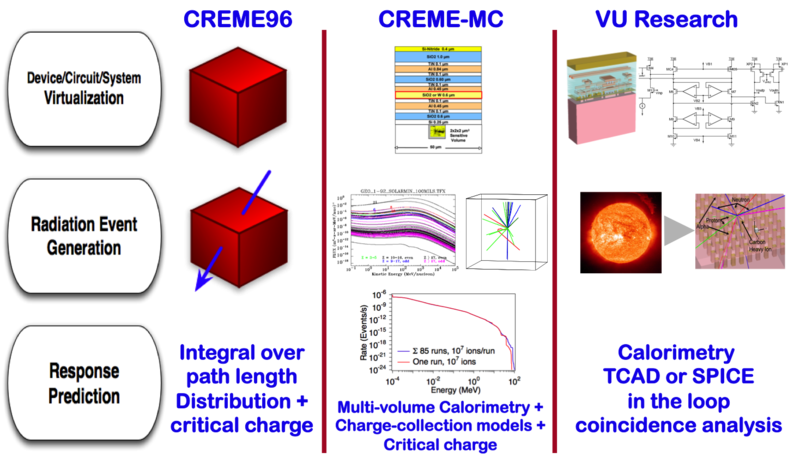 As the host for CREME96 and CREME-MC, ISDE employs a comprehensive approach from basic particle interactions to large-scale circuit and system performance. Our Radiative Energy Deposition software or MRED is a custom radiation-transport code developed in-house and is based on the Geant4 libraries. The code is comprehensive in its treatment of all forms of radiation interacting with materials and is designed to be a flexible and linguistically consistent initial-condition generator that interfaces to programs that handle related tasks such as charge transport, charge collection, and the analysis of circuit-level radiation effects. MRED is calibrated to data and has a proven record of predicting both terrestrial and space experimental radiation results.